We need to know which year you have when ordering, please make a note of the year during check out. NOTE: If you need one to fit 2010+ Teryx, see #10655. 14 gauge powder coated metal frame. Mounts with EMP quick connect clamps. Gasket along the bottom protects your hood. Ships via regular ground (not over-sized). Our quick connect clamps allow you to easily remove your windshield without any tools. 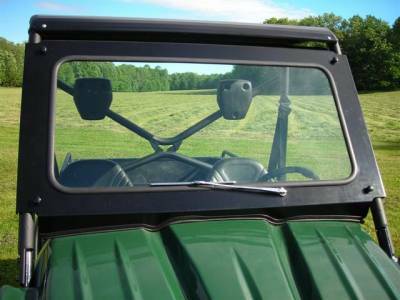 Simply remove four thumbscrews and the clamps remain on your rail cage so you can easily install your windshield again.